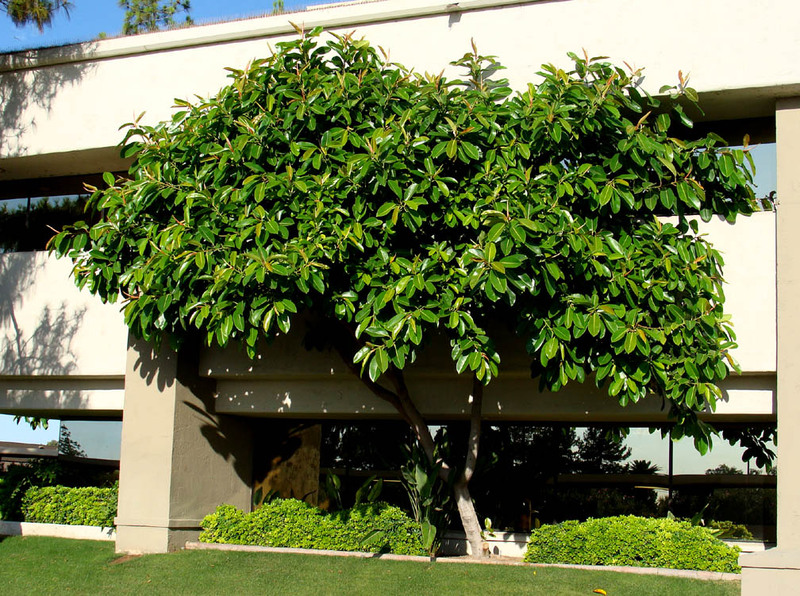 Landscape Use: Mostly used in Phoenix as a large foundation tree up tight against north and east walls of single and multiple story buildings, commercial building courtyard planters, and in large atriums and courtyards. It is also used as container plant on patios or indoors. Its large leaves make it a bold textural accent plant. Form & Character: Upright and rounded with age and size, bold, bright and tropical, somewhat irregular at times. Growth Habit: This is a soft-wooded evergreen perennial that is upright and branched from 5 to 25 feet in height (taller in more favorable climates) with a less than equal spread. Foliage/texture: Large, glabrous, simple, ovate and fleshy leaves with a distinct mid-vein and rounded petiole, foliage ranges in color from green to deep burgundy green. Leaves emerge at terminal meristems from a reddish sheath. All leaves and stems drip copious amounts of white latex when cut or damaged; very coarse texture. Flowers & fruits: Not showy and rarely seen when cultivated in Arizona. Temperature: Intolerant of freezing temperatures below 32oF or desert summer heat above 115oF. Light: Partial to full shade is best in Phoenix (especially from western sun). Mature specimens of rubber tree can take some full sun for up to 6 to 8 hours a day, but absolutely NO western exposures (otherwise it's french fry time!!!). 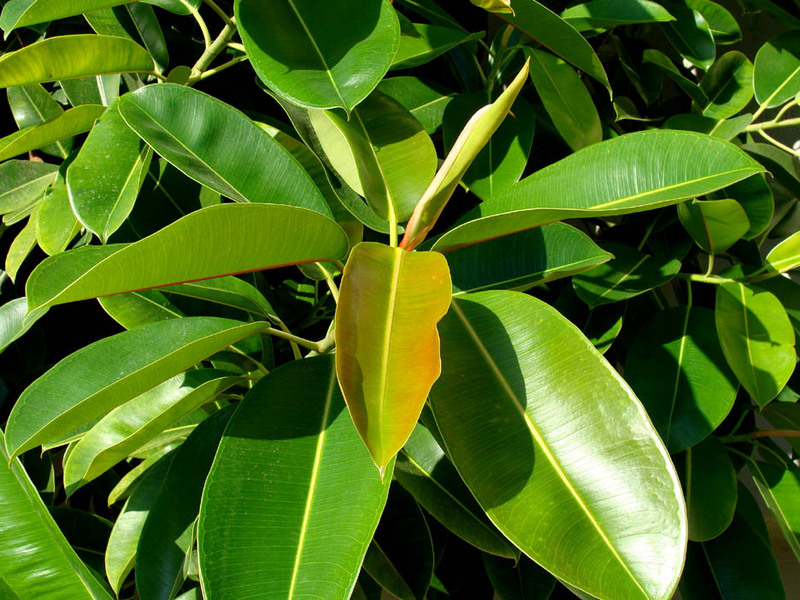 Watering: In Phoenix, rubber tree needs regular amounts of supplemental water. Pruning: Rubber tree requires ample pruning to develop a strong scaffold branch structure when young. Once mature, one must take great care to preserve a full canopy of leaves (no crown thinning) to protect the crown structure from sunscald injury. Also, make sure to place a large tarp underneath any larger rubber tree when pruning due to the heavy exudation of white milky, sticky latex sap from pruning wounds (I'm serious, it is that bad!). Propagation: Softwood cuttings or air layering are both easy. 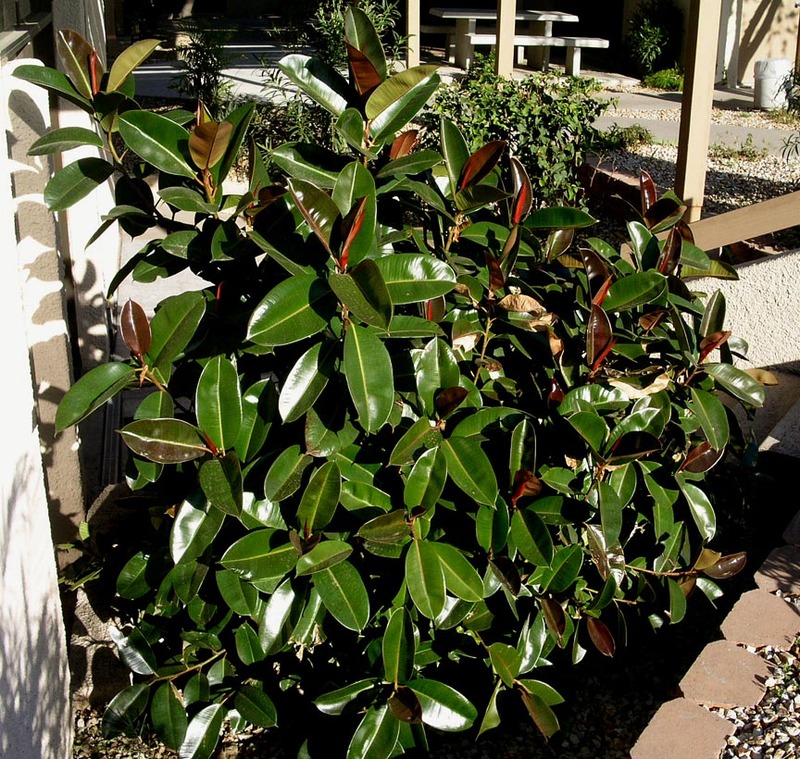 Additional comments: Rubber tree is a long-time popular container house plant. Its leaves and stems exude copious amounts of white latex sap that can stain indoor or outdoor surfaces. Here is an excellent Florida web site about production of rubber tree. There are many named cultivars including 'Rubra' (my personal favorite).